Despite losing almost all its Marvel related content, Netflix has proved that it still can produce a popular comic book adaptation. According to The Hollywood Reporter, Netflix has announced in its earnings report for the recent financial quarter that The Umbrella Academy has been viewed by more than 45 million member households in its first month. The report only discussed Netflix Original content’s success on the platform and claims that the series’ views are as many as Netflix’s new documentaries Fyre: The Greatest Party That Never Happened and Our Planet combined. Moreover, it says that The Umbrella Academy came justbehind Triple Frontier, which racked up more than 52 million views. The company counts it as a view when the user has watched at least 70 percent of one episode of a series or 70 percent of a film. Moreover, content chief Ted Sarandos discussed during a recent Q&A that Netflix will release more ratings data in the future. “We’re going to be rolling out more specific granular reporting, first to our producers and then to our members and, of course, to the press, over time and be more fully transparent about what people are watching on Netflix around the world,” Sarandos said. Given the series’ success, The Umbrella Academy will return for a second season. The story is based on the popular, Eisner award-winning comics and graphic novels created and written by Gerard Way (My Chemical Romance), illustrated by Gabriel Bá, and published by Dark Horse Comics. Season 1 stars Ellen Page, Tom Hopper, Emmy Raver-Lampman, Robert Sheehan, David Castañeda, Aidan Gallagher, Cameron Britton, Mary J. Blige, Colm Feore, Adam Godley, John Magaro, Ashley Madekwe, and Kate Walsh. Universal Cable Productions produces the series for Netflix. Steve Blackman (Fargo, Altered Carbon) will return as executive producer and showrunner for Season 2. The additional executive producers are Jeff F. King (Hand of God), Bluegrass Television, and Mike Richardson and Keith Goldberg from Dark Horse Entertainment. Gerard Way and Gabriel Bá will serve as co-executive producers. 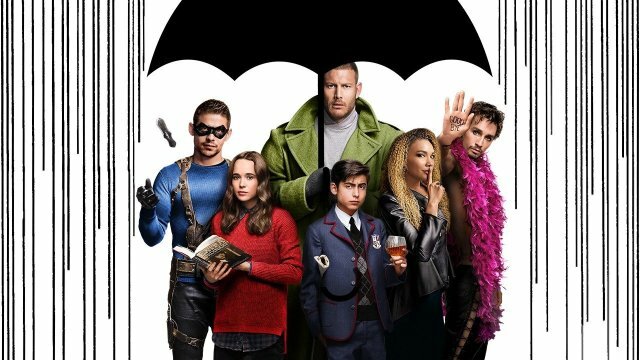 The Umbrella Academy is now available on Netflix.